Looking for an experience to remember? Then step back in time and enjoy refreshments at Aunt Martha's Victorian Tea-rooms and gardens. 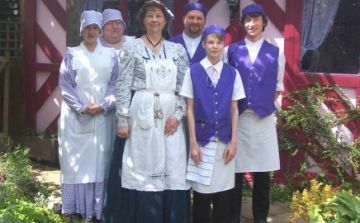 Meet Aunt Martha and her staff, all dressed in period Victorian clothes, and waiting to give you a warm welcome. Enjoy what was once standard - pretty table clothes - nice china - proper serviettes - loose tea - sugar cubes and of course, tasty homemade food served in style. Food allergies like gluten and dairy intolerances are catered for. 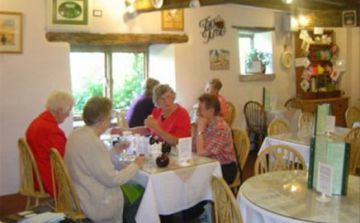 WINNER of the Cotswold Life magazine 2014 award for the best Local Tea Room and Finalist in the 2014 Taste of Gloucestershire Awards for the Best Independent Tea-rooms. Housed in a cosy, traditional tearoom setting, you'll find beautiful bone china, a friendly relaxed service and good old fashioned recipes. The Old Dairy serves everything from breakfasts & light snacks, to home cooked lunches, including Sunday roasts (booking advisable for Sunday lunch). Gluten-free bread, cakes & gravy, soya alternatives to dairy - including a heavenly homemade dairy-free chocolate cake! - always available. 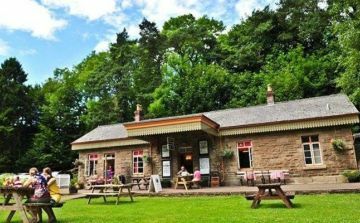 Situated in the original railway waiting room you can enjoy a range of freshly prepared meals and delicious home baked cakes (including lavender cake), traditional bread pudding and strawberry cream teas as featured in the AA afternoon tea guide). Indulge in a fireman's shovel grilled breakfast. For lunch a variety of freshly prepared sandwiches and panini's, as well as our famous Tintern cheese platter. Homemade soup and bacon rolls are available all day.